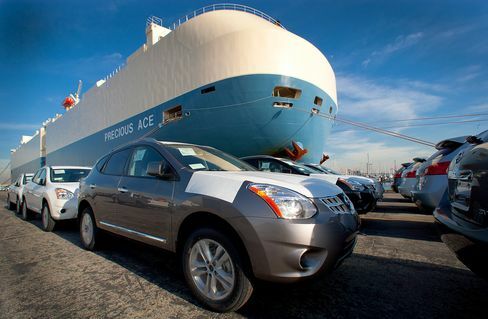 June 11 (Bloomberg) — Seaborne shipments of vehicles are rising to a record as the U.S. imports the most in five years, making car carriers profitable at a time when most of the merchant fleet is losing money. Global trade will advance 7.2 percent to 23.27 million vehicles this year, according to Clarkson Plc, the largest shipbroker. U.S. imports will expand 3.6 percent to 3.75 million units, the company estimates. Shares of Wilh. Wilhelmsen ASA, the biggest operator of car carriers, will gain 12 percent in 12 months in Oslo trading, the average of eight analyst estimates compiled by Bloomberg shows. Even with expanding U.S. imports, domestic automakers are still winning, with light-vehicle sales on pace for the best year since 2007. The extra shipments are compensating for weakness in Europe, where recession is battering a region that accounts for about 30 percent of global trade. Wilhelmsen will haul 20 million cubic meters (706 million cubic feet) of cargo in the fourth quarter, compared with 17.5 million in the first three months, ABG Sundal Collier Norge ASA estimates. The U.S. car industry is booming after General Motors Co. and Chrysler Group LLC emerged from bankruptcy in 2009. The federal government spent $80 billion to bail out the industry. Including suppliers and dealers, it employs 8 million people and accounts for 3 to 3.5 percent of U.S. economic output, according to the Alliance of Automobile Manufacturers. Shares of Ford, based in Dearborn, Michigan, rose 22 percent this year and will gain another 3.8 percent in 12 months, according to the average of 15 analyst estimates. Detroit-based GM will extend the year’s 20 percent advance by 13 percent, the average of 20 estimates shows. Chrysler is majority-owned by Fiat SpA, based in Turin, Italy. Sales in the U.S. are contributing to gains in exports from Asia and Europe and diminishing spare capacity in the car-carrier fleet. Japan’s shipments will increase 5.9 percent to 5.19 million vehicles this year as South Korea’s sales expand 6.7 percent to 3.52 million, Clarkson estimates. European volumes to North America will rise 7 percent to 1.23 million, helping to offset a 2.5 percent decline in domestic demand, according to LMC Automotive, a researcher in Troy, Michigan. Shares of Lysaker, Norway-based Wilhelmsen fell 5.8 percent to 47.80 kroner since the start of January, after advancing 74 percent in 2012. They will rebound to 53.48 kroner in 12 months, the analyst estimates show. While analysts expect Wilhelmsen to report a 39 percent drop in net income for this year, 11 out of 15 recommend buying the shares as everything from oil tankers to dry-bulk vessels hauling coal are unprofitable. Wilhelmsen operates its own carriers and hires extra ships when cargo volumes increase. The company benefits most when demand expands “slightly faster” than the fleet because larger capacity shortages increase its chartering costs, Magelie said. It is currently running 145 carriers, which on a global average are about 700 feet long and take 6,000 cars each. Nippon Yusen K.K., Mitsui O.S.K. Lines Ltd. and Kawasaki Kisen Kaisha Ltd., all based in Tokyo, are the biggest owners of car carriers. Wilhelmsen says its strategy of hiring extra capacity means it is the largest operator of the vessels. The three Japanese companies also own and oversee container ships, dry-bulk vessels, oil tankers and gas carriers. U.S. light-vehicle sales climbed 8.2 percent last month, exceeding analyst estimates and boosting the annualized industry sales rate to 15.3 million units, from 14 million in 2012, according to Autodata Corp., a Woodcliff Lake, New Jersey-based research company. The U.S. unemployment rate was 7.6 percent in May, down from as much as 10 percent in 2009, and the economy will accelerate for at least the next four quarters, estimates from as many as 73 economists compiled by Bloomberg show. Shipments may weaken because the industry is moving production to where vehicles are sold. Toyota Motor Corp., the largest automaker by number of vehicles sold, made 19 percent of its cars in North America in the fiscal year that ended in March, from 15 percent in 2010, data compiled by Bloomberg show. The three largest U.S. automakers added 1.2 percentage points of American market share from overseas suppliers in the year to May, the first simultaneous advance in at least 18 years. Wilhelmsen and its industry peers also use car carriers to transport high-and-heavy cargoes, an industry term to describe vehicles such as bulldozers, diggers and fork-lift trucks. Those shipments may weaken as mining companies curb spending after commodities retreated. The Standard & Poor’s GSCI gauge of 24 raw materials fell 30 percent since reaching a record in 2008. Caterpillar Inc., the largest maker of mining equipment, cut its 2013 earnings forecast to about $7 a share in April, from a January projection of $7 to $9, citing lower-than-expected demand from commodities producers. About A$150 billion ($147 billion) of mines and projects have been delayed or canceled in the past year in Australia, the biggest iron-ore shipper, the government estimates. Analysts expect car shipments to compensate for fewer high-and-heavy cargoes, projecting a 23 percent gain in Wilhelmsen’s net profit to $306.3 million next year, from $248.5 million in 2013, the mean of 11 estimates shows. That contrasts with most of the rest of the merchant fleet, where a glut of capacity has driven shipping rates below what owners need to break even. The ClarkSea Index, a measure of industrywide earnings, averaged $8,684 a day in the first quarter, the lowest since 1992. The gap between demand and freight capacity was the widest in March since the early 1980s, London-based Clarkson estimates. Car carriers are faring better in part because owners didn’t order as many new ships. The fleet expanded 18 percent since the end of 2008, compared with a 26 percent gain in the largest oil tankers and a more than doubling in the capacity of Capesizes, which haul iron ore and coal, Clarkson data show.